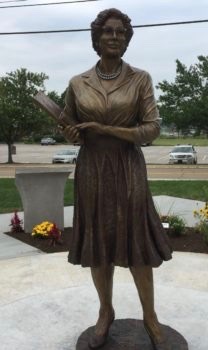 This statue of Katherine Johnson now stands at a NASA facility in Fairmont USA and the facility has been named after this brilliant mathematician who was featured in the film “Hidden Figures”. The film uncovered the truth of women's importance in NASA - whose calculations were crucial to the USA reaching outer space. Katherine Johnson working for NASA in 1966.